In mere seconds, a system developed at the Department of Energy’s Oak Ridge National Laboratory can identify and characterize a solid or liquid sample, providing a valuable tool with applications in material science, forensics, pharmaceuticals, biology and chemistry. The device and technique, created by Gary Van Berkel and Vilmos Kertesz of ORNL’s Chemical Sciences Division, is described in the journal Rapid Communications in Mass Spectrometry. The appeal of this open port sampling interface, researchers note, is its elegance, speed and ease of use. “The simplicity of our device allows even novices with the means to introduce unprocessed solid or liquid samples into a mass spectrometer without fear of instrument contamination,” Van Berkel said. 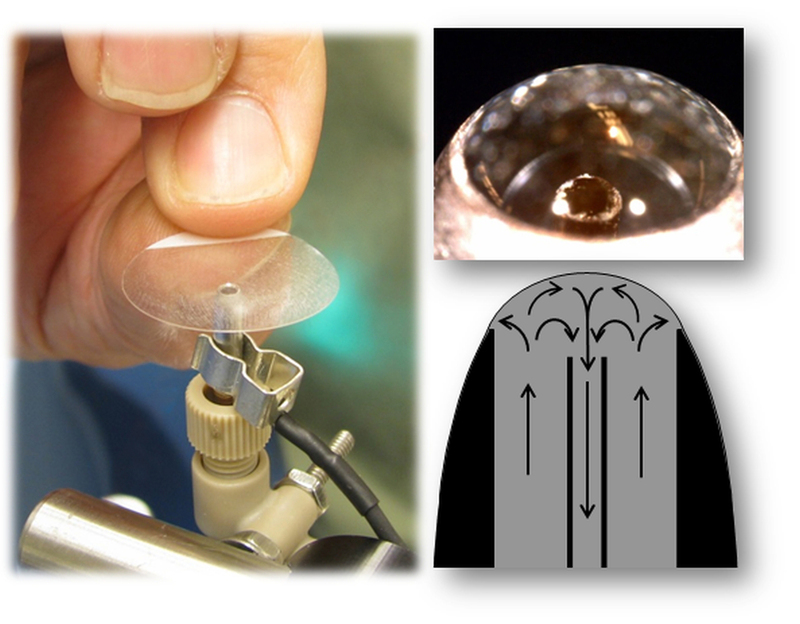 To identify a compound, researchers simply touch the object of interest to the solvent dome at the sampling end of the probe, which is connected to a mass spectrometer. Almost instantaneously, a screen displays data that identifies the chemical and its approximate concentration. Because this approach requires no sample preparation and the device is self-cleaning, the system is especially attractive for a wide range of applications, Van Berkel said. He expects the first versions of the patent-pending device to be a cost-effective addition to existing mass spectrometry systems that are commonplace in university, government and clinical laboratories. The paper, titled “An Open Port Sampling Interface for Liquid Introduction Atmospheric Pressure Ionization Mass Spectrometry,” is available at http://onlinelibrary.wiley.com/doi/10.1002/rcm.7274/abstract. Funding for this research was provided by DOE’s Office of Science. Skin sampling work was supported by AB Sciex (http://sciex.com), a supplier of life science analytical platforms and licensee of ORNL technologies, through a cooperative research and development agreement. TechmerPM of Clinton provided PET resin and color chips and related chemical standards.